AUTOSPORT's final bumper magazine of 2011 looks back at just about every aspect of the motorsporting season but F1 - which we reviewed in the Christmas issue. OK… the beady-eyed readers of AUTOSPORT magazine have been asking where our season reviews have disappeared to. The answer is: they've mostly migrated to an epic special review issue that's in the shops this Thursday, December 29. Let's face it, with all the teams having shut down for Christmas, and virtually nothing happening on track or stage (unless you're an ice racing fan, of course), there's not been much to report for the past week. 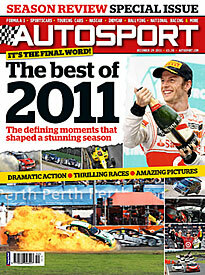 So it made perfect sense to arrange this issue and use the motorsport industry's downtime to reflect on a memorable 2011 season. Formula 1 was, of course, already reviewed in our Christmas issue, but we finish the year with our F1 diary of 2011 to look back on a dramatic 12 months. Then it's onto the meat of the issue, with the IndyCar Series (reviewed by Charles Bradley), GP2 and GP3 (Glenn Freeman), all the leading international sportscar championships (Gary Watkins), the World Rally Championship (David Evans), DTM (Jamie O'Leary), World Touring Car Championship (Mark Glendenning), British Formula 3 (Ben Anderson), Formula 2 (Sam Tremayne) and Formula Renault 3.5 (Peter Mills) – not to mention our World of Sport round-up of other international series and then a full run-through of the best of British club action of 2011. The magazine finishes with Rally of my Life, which features John Davenport looking back on a very special performance alongside Ove Andersson on the Safari Rally.